The main difference between operating system and application software is that an operating system is a system software that works as the interface between the user and the hardware while the application software is a program that performs a specific task. 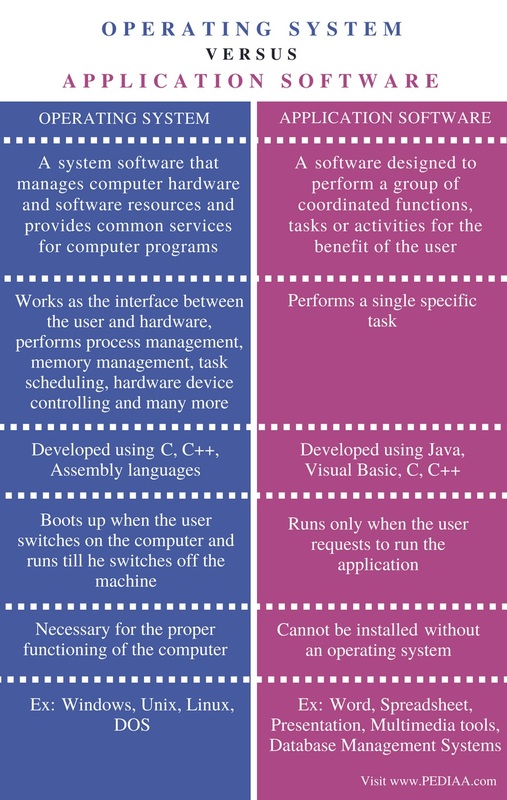 Computer software is divided into system software and application software. System software is the type of software that is used to run hardware devices. Operating systems, language processors and device drivers are few examples for system software. Application software is the type of software that is designed to achieve a specific user requirement. Word processors, spreadsheets, web browsers are some application software. Apart from these types, there is another software called utility software. This software assists the tasks of the system. Antivirus software, file and disk management tools are some examples of utility software. An operating system works as the interface between the user and the hardware. The entire functionality of the computer system depends on the operating system. Windows, DOS, Linux, Unix are few examples for operating systems. An operating system performs a variety of tasks. It handles file and directory creation and deletion. It manages process creation, deletion, suspension and synchronization. It also allocates and deallocates memory space. Another key point is that the operating system manages and controls hardware devices. Furthermore, it prevents the system from unauthorized access and secures the data and resources. Overall, an operating system is one of the most vital components of the computer. An application software performs a single task. These type of software programs are specially designed to solve particular problems such as document creation, doing calculations, image editing etc. There are various types of application software. Word allows the users to create documents. Spreadsheets allow the users to create financial documents, graphs and charts and to perform complex calculations. Database Management Systems such as MySQL, MSSQL allows the users to store, retrieve and manipulate data. Multimedia tools are also application software that allows the users to create and edit images, videos and adding after effects. Furthermore, business organizations use application software according to their business requirements. A Human Resource Management Software helps to keep a record of employee details, salaries, leaves, etc. A Hospital Management Software helps to record patient, doctor, staff and payment details. Those are some examples of application software. An operating System is a system software that manages computer hardware and software resources and provides common services for computer programs. Application software is a software designed to perform a group of coordinated functions, tasks or activities for the benefit of the user. The operating system works as the interface between the user and hardware. It also performs process management, memory management, task scheduling, hardware device controlling and many more. In contrast, an application software performs a single specific task. C, C++, Assembly are common languages to develop operating Systems. Java, Visual Basic, C, C++ are some languages to develop application software. Operating system boots up when the user power on the computer and runs till he switches off the machine. On the other hand, Application software runs only when the user requests to run the application. 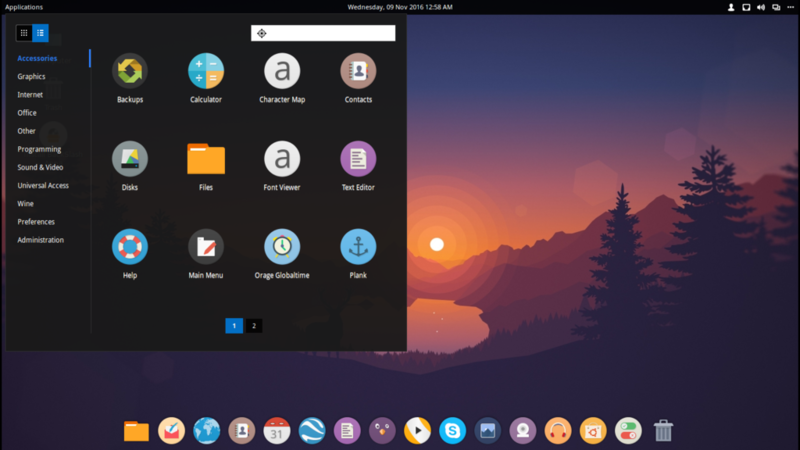 The operating system is necessary for the proper functioning of the computer. It is not possible to install application software to the computer without an operating system. Windows, Unix, Linux, DOS are few examples for operating systems. Word, Spreadsheet, Presentation, Multimedia tools, Database Management Systems, Graphics software are some examples of application software. The difference between operating system and application software is that an operating system is a system software that works as the interface between the user and the hardware while the application software is a program that performs a specific task. It is not possible to install application software to the computer without an operating system. 1. “Basics of Computer Science Operating System.” Www.tutorialspoint.com, Tutorials Point, 8 Jan. 2018, Available here.